Learn to make Restaurant Style Indian Garlic Naan – 3 Ways with a step-by-step video recipe. Tawa Naan | Cooker Naan | Oven Naan | Naan Without Tandoor. What can be done to get that restaurant style garlic naan? 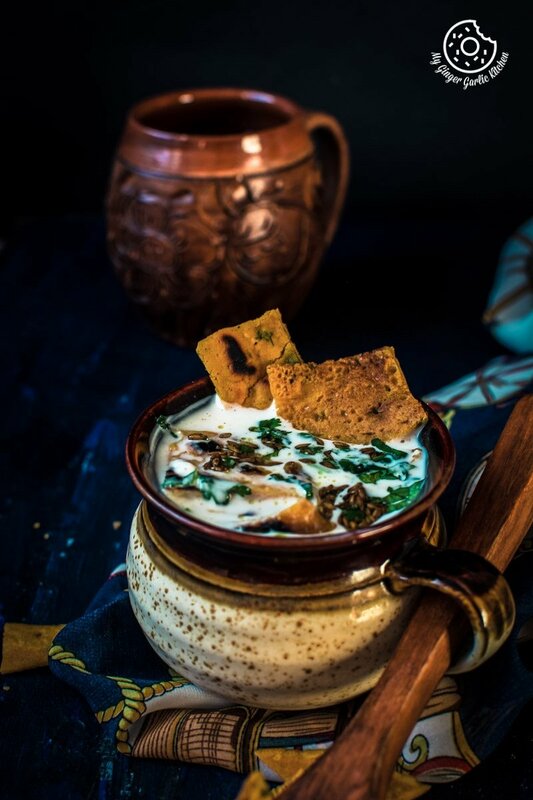 In today’s recipe, I will show you 3 simple ways of making naan at home without tandoor (clay oven). You might be thinking that Monday and fun-day don’t usually sit in the same car. Or at least they are not usual best friends in my dictionary. My week slowly catches up with the pace. Why I am happy about Monday, you must be wondering. It’s bright and sunny outside which is a rare sight in Finland during winter. And also because I love the sun. But I assume, that’s what everyone does. 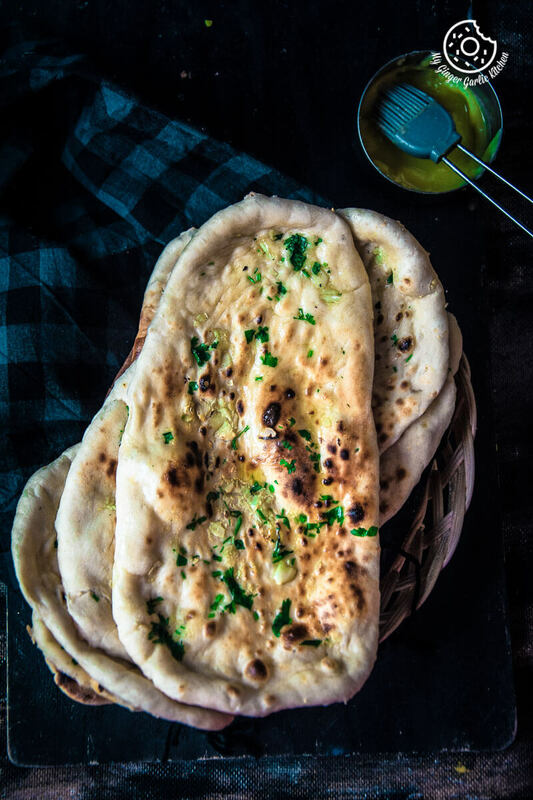 We all enjoy naans, but have you tried your favorite restaurant style garlic naan at home? 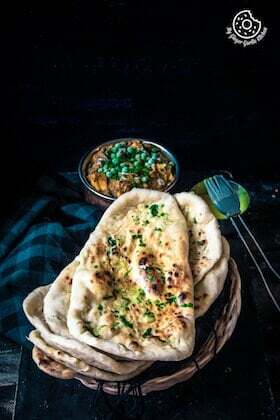 Sometimes while making restaurant-style food at home, I crave for some delicious garlic naan too. The process of making naan might sound complicated, but guess what, it is an easy process. Yes, making your own naan is quite easy and simple. You all must be aware of naan bread. I am saying this because I have yet to meet a person who hasn’t tasted the naan bread yet. But don’t worry if you are the one who doesn’t know about it, I am here to help. Naan is one of the most popular leavened breads in Indian cuisine. 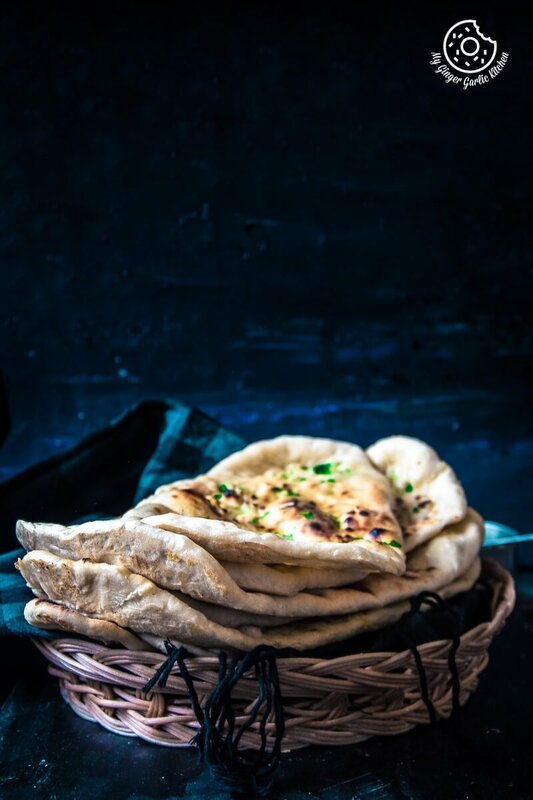 If you love naan and always wondered whether you can make your own naan at home or not, then this recipe is for you. Or if you know how to make naan but want to try a different method, then surely this recipe for you. 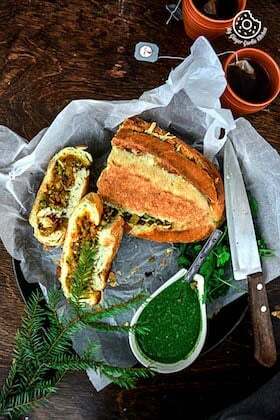 Or if you love any kind of flatbread then this naan recipe is calling you. You can make them on hot tawa/pan. You can make them in a pressure cooker. Or you can make them in the oven. 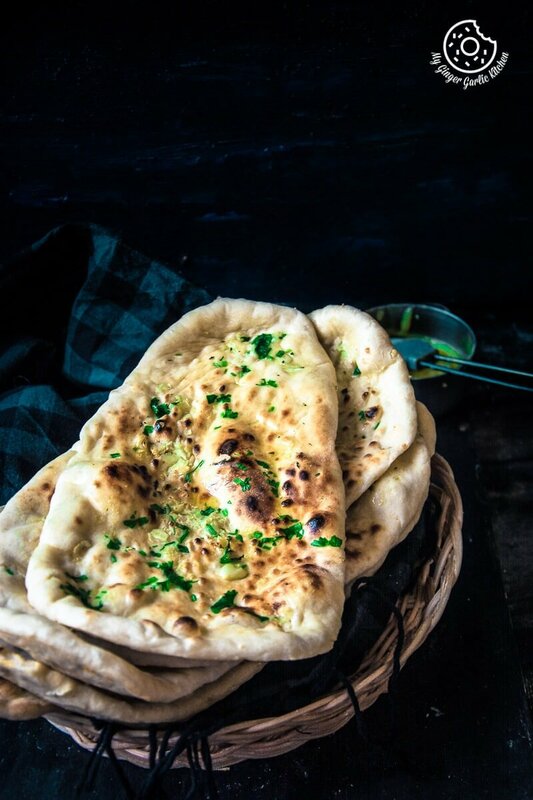 So all I can say that making your own garlic naan at home is super simple and easy. This naan is egg free. It’s dairy-free. It’s vegan. 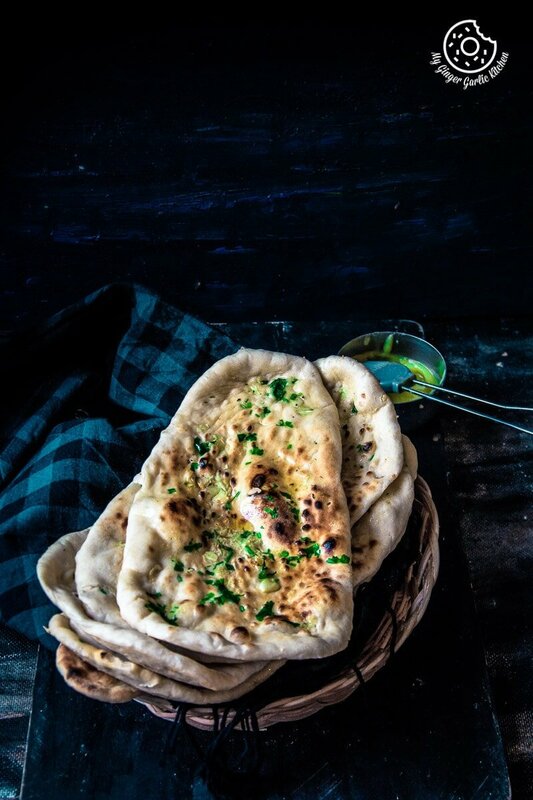 Let’s make this egglessRestaurant Style Indian Garlic Naan – 3 Ways at home. 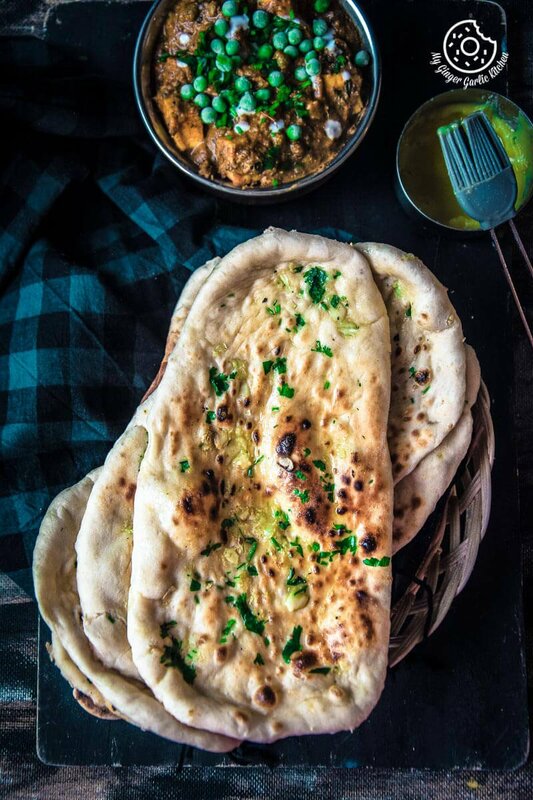 Restaurant Style Indian Garlic Naan - 3 Ways. What can be done to get that restaurant style garlic naan? In today’s recipe, I will show you 3 simple ways of making naan at home without tandoor (clay oven). 1. Combine garlic and ghee in a small bowl and mix well. Set it aside. 1. In a small bowl, mix the yeast and sugar with one ¼ cup of warm water. 1. Roll a dough ball into an oval shape and stretch it from all the sides to shape it into a teardrop. 2. Don't roll them out too thinly or they'll turn out like crisps. 3. Heat a pan/tawa over medium-high heat. 4. Apply water on one side of naan and place the water side down on the tawa. 5. Cook for about one minute, until the dough, puffs up. 6. Once the naan start bubbling and dough start drying, flip the tawa over hot plate or flame and cook for one more minute or until they turn golden brown. 7. Brush the cooked naan with melted garlic ghee or butter. 8. Cover with a cloth to keep warm until serving. Garlic Tawa Naan is ready. 3. Heat a pressure cooker over medium-high heat without the lid. 6. 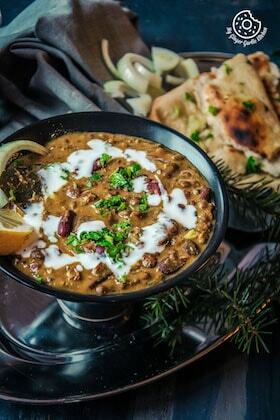 Once the naan start bubbling and dough start drying, flip the pressure cooker over a hot plate or flame and cook for one more minute or until they turn golden brown. 8. Cover with a cloth to keep warm until serving. Garlic Cooker Naan is ready. 2. Roll a dough ball into an oval shape and stretch it from all the sides to shape it into a teardrop. 3. Don't roll them out too thinly or they'll turn out like crisps. 4. Place rolled naan on a lined baking tray and put it in the top of the oven and broil for about 1-2 minutes. Flip it over and broil for 2 more minutes. 5. Brush the cooked naan with melted garlic ghee or butter. 6. Serve fresh from the oven. 1. To make it cheese garlic naan, add sprinkle some mozzarella cheese or cheddar cheese on top of each naan after cooking.